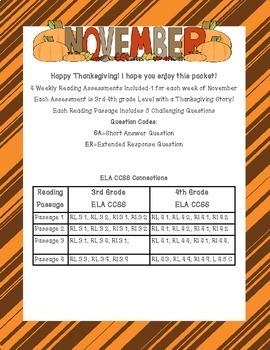 This packet includes assessments for each week of November. There are four passages, each created by me, that include five questions for each passage. Each extended response or short answer question is labeled with ER or SA. 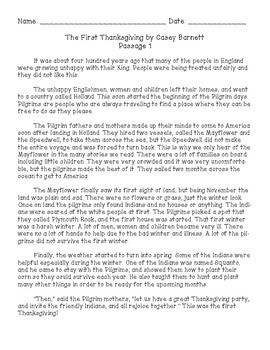 Each passage is aligned to the 3rd and 4th grade ELA Common Core State Standards with a Thanksgiving theme. 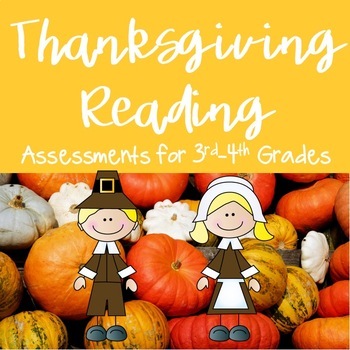 You can use these assessments for group activities as well or to practice techniques for answering test questions. As always, please ask any questions and download my preview before purchasing. Thank you for shopping!